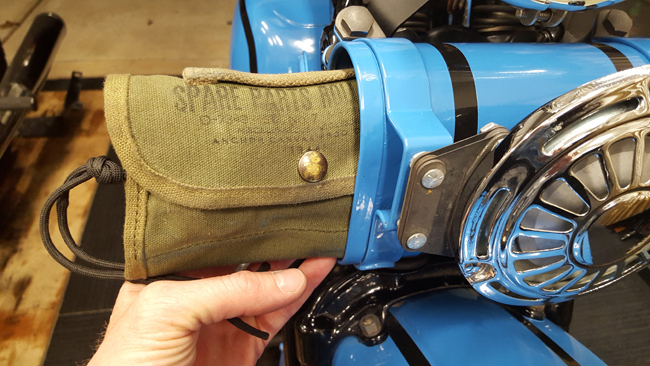 Nowadays it seems like anyone who can sew together waxed cotton or leather is making a motorcycle tool roll. Don't get me wrong, there are some real works of art being produced to keep your oily tools secured, but on a whole, they are all a bit too large for my application. Like all the VL models, my '33 came from the factory with a locking metal tool box. It measures in at just under 8", so finding a tool roll that could fit comfortably inside it was a bit of a challenge. 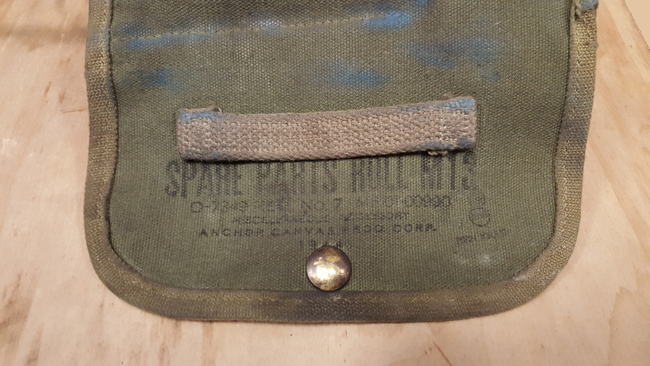 After about an hour of searching the internet for a "miniature" motorcycle tool roll, I stumbled across an upcycled US Military M13 spare parts roll on Etsy. I purchased the tool roll from a company called New Leaf Fabrications which specializes in upcycling military surplus. For this particular piece, the internal pouches have been restitched to allow for longer tools to be inserted and the canvas has been rewaxed with their "home brew" canvas wax. Looking at the picture above, you can see that it holds quite a few tools (I've pulled them out so you can see them better). 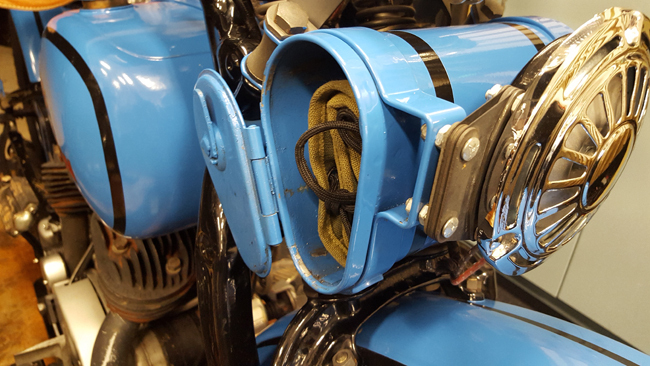 New Leaf Fabrications also added a piece of paracord which turned out to make a great pull cord for removing it from the tool box. When rolled up, the shape is not perfectly round, but actually closer to the pear shape of the tool box. This makes for a snug fit, but not so tight that you have trouble removing it. Over the course of my cross country ride, that tool roll was pulled in and out of my tool box dozens of times. 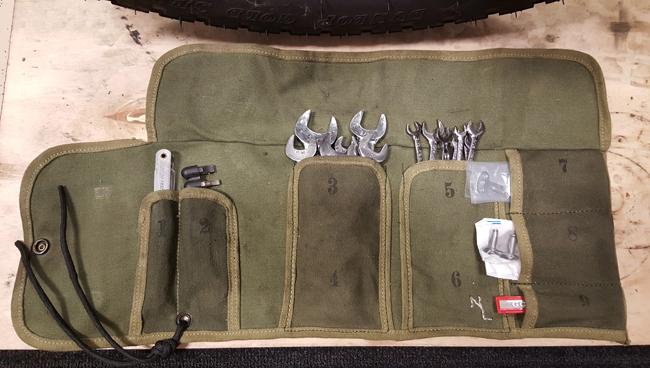 It contained our only complete set of wrenches, so when either motorcycle needed an adjustment, out came the tool roll. Besides a little blue Rustoleum and a grease stain or two, the tool roll looks just as good as the day I got it. The snug fit not only kept the tools from rattling for 3600 miles, but also kept the canvas from wearing or fraying. 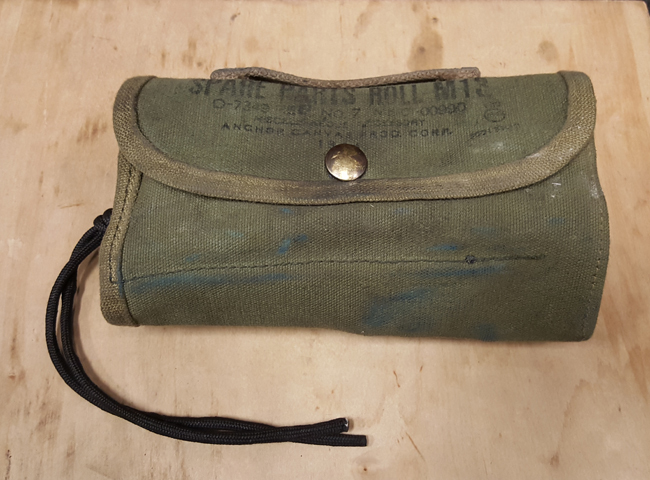 Remember this is a military surplus tool roll, so the quality is exactly what you would expect from military field grade equipment. If you've got a VL out in your garage, you need this tool roll. Supplies are limited, so check out New Leaf Fabrications while they still have some available.